The Gramophone-award winning partnership of Gerald Finley and Julius Drake turns to perhaps the most celebrated song-cycle of them all. 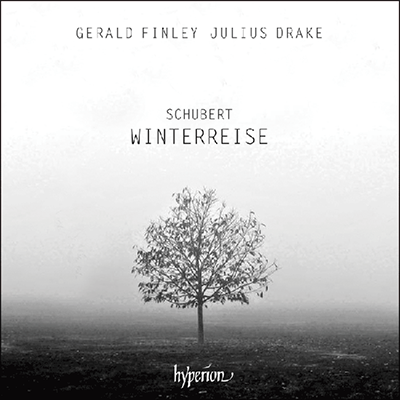 Schubert’s Winterreise is a masterpiece of despair, astonishing in its bleakness and enthrallingly mesmerizing as the journey continues. Finley brings all his considerable dramatic powers to his performance—and all but submerges them under the ice. Richard Wigmore writes that ‘before Winterreise Schubert had composed individual songs of pathos and despair, even of apocalyptic terror. What was new about the cycle was the spareness and angularity of much of the writing, the work’s sustained godless pessimism and its obsessive exploration of a mind veering between delusion, ironic self-awareness and nihilistic despair. The water music, limpid, turbulent or benedictory, of Schubert’s earlier Müller cycle, Die schöne Müllerin, yields in Winterreise to musical emblems of trudging and stumbling, bareness and exhaustion, derangement and frozen, trancelike stillness’.